Bundesliga | Reus, Konoplyanka, Sancho or Yarmolenko - who would be YOUR Schalke/Dortmund dream team left winger? Reus, Konoplyanka, Sancho or Yarmolenko - who would be YOUR Schalke/Dortmund dream team left winger? 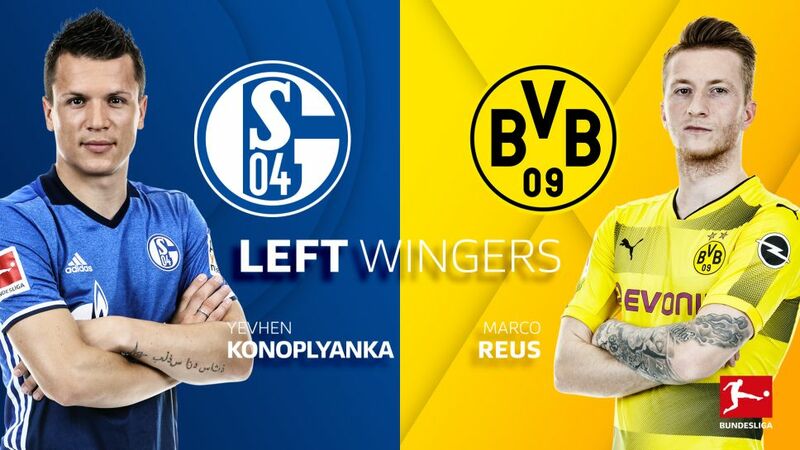 The four candidates for the left wing position are: Yevhen Konoplyanka, Marco Reus, Jadon Sancho and Andrey Yarmolenko. Cast your votes in the poll below! Reus was out until Matchday 22 recovering from the knee ligament injury he sustained in last season’s DFB Cup final triumph, but the fact he makes this list at all is testament to the earth-moving impact he had when he returned. The three goals he scored in his first four games back were worth five points to Dortmund, but he also clearly had an uplifting effect on the whole team, whose confidence seemed buoyed by the simple fact of having their iconic forward on the pitch again. Back after another short spell on the sidelines, the Germany international will no doubt play a key role in the final straight. Sancho’s first season in the Bundesliga was always going to be an acid test of the 18-year-old’s ability, and though he remains a work in progress, his seven league appearances — just three of which were starts — hinted at immense promise. Injury has been the bug-bear of Yarmolenko’s first campaign in Germany — the Ukrainian has played just three Rückrunde matches — gave a positive first impression in his 16 league games, scoring three times. His former Dynamo Kiev cohort, Konoplyanka, has punctuated a mixed season with highlights, notably his opening day goal in the win over RB Leipzig, and his central role in the incredible 4-4 draw with Dortmund on Matchday 13.